So when I heard of a monthly subscription for beauty products I couldn’t wait to join. Especially when you stick with the same brand because you don’t want to spend a lot of money, to experiment. Well when I decided to give it a try, I was overwhelmed with how many actual monthly beauty boxes there are. The more popular ones being Ipsy, Birchbox, & Glossybox, which also range in price. They also have boxes for specific needs like Julep Maven for Nail Polish Junkies and CurlBox for hair products. My main concern was that I would only get samples sizes of brands I had never heard of. But when you take the quiz, they ask you what brands you like & they have some well known brands like too Faced, Stila, Smashbox & many more. I reviewed “Glam Bags” which is what they call them, from previous months & was happy to see recognizable brands & good size products. I made my decision, I would start an Ipsy monthly subscription, which costs only $10 a month and includes shipping. I went on their website to sign up, but that did not work out like I had planned, there is a wait list to get the subscription started. I received an email to follow some steps so I could move up the wait list faster; the usual share on Facebook for your friends, follow them & a few others. Once I followed all the steps, I received an email that I would be sent a bag starting next month, which would be June. I just couldn’t wait to get it, I was anxious what would it contain. 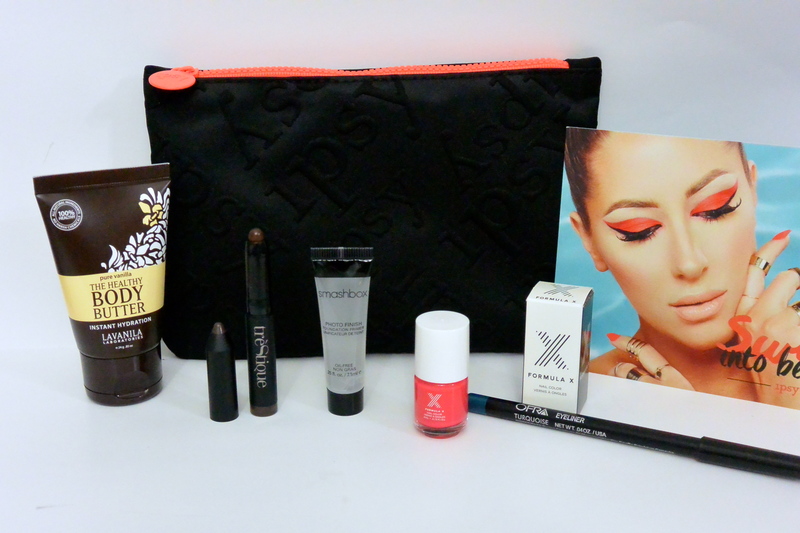 It comes with a re-usable make up bag, and 4 or 5 products that range from beauty, hair or skincare. It’s all based on the quiz that you take when you sign up. Well I can say that I was very happy with my June Glam Bag, so far I have received 3 bags and have discovered some brands I hadn’t heard of but loved. The products are a good size, enough for you to try & decide whether you like or not, plus some are full size. I also like that you can go on Instagram & see pictures of how the beauty product is being used, which is a plus. You can also get full size products from points, which you earn. By reviewing the products you received and also by having your friends sign up for a subscription. So here are my Ipsy bags from June, July & August.